The following are some hopefully useful templates (mostly based on Delta’s discussion of the rates in Advanced Dungeons & Dragons 1e Dungeon Master’s Guide). They show the cost to enter1 a hex on the overland travel map, with a key to how many hexes a party can move in a day based on the degree of encumbrance (for travelling on foot) or type of mount. The assumption (following the DMG) is that roads and trails do not speed your travel enough to track, but they do allow you to pass over worse terrain as if you were on clear terrain. That doesn’t completely match up with the way, say, the Cook Basic D&D works, but it’s easy enough to increase the rates on roads if you’re really inclined. If the cost of entering a hex is more than a single day’s allotment (e.g. 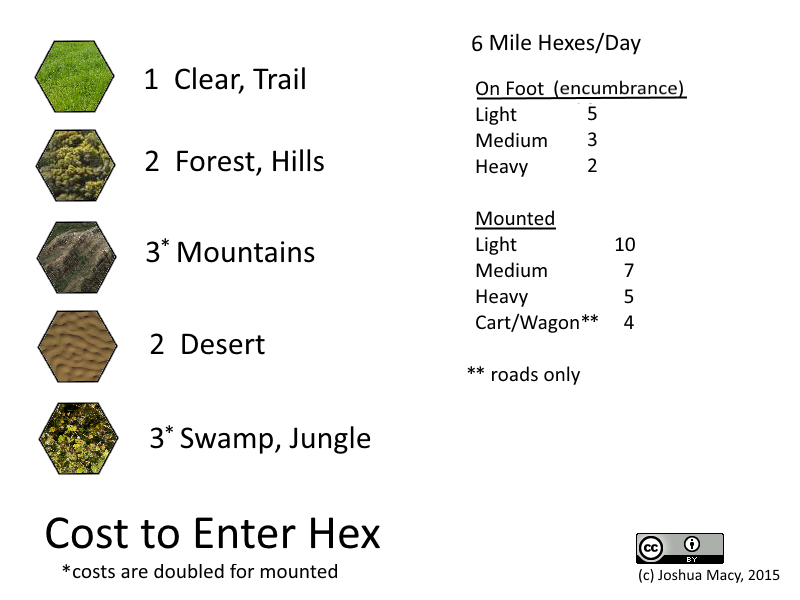 on heavy horse in a swamp with no road), you can either say it’s impassible, switch to a smaller scale map and have the party slog through taking multiple days, or make the minimum rate of travel 1 hex per day or 1 hex every other day. While these have been derived from D&D, they are non-system specific, and are released under a CC-BY license (that is you can use them any way you want, but you should credit me somewhere)/ Enjoy.